Depending on your needs and wants, you’ll find that this air fryer will make delicious food. Though the basket doesn’t have a non-stick coating, you can corral this issue by using some Pam or other non-stick product. It produces healthy food quickly and easily, and it is easy to clean. For those that don’t have a lot of time on their hands, they will appreciate the simplicity of the air fryer. Nearly anyone can use it, and as long as you get the temperatures right, you should have perfectly cooked food every time. It’s an excellent choice for those that want to add a nice appliance to their kitchen. Air fryers have become popular in recent years, and it’s not surprising to see why. They have less fat and oil than traditional deep fryers, and they cook food quickly. In an age where cooking food quickly is rare, having an air fryer will make home cooked meals better. The NuWave 36001 Brio Air Fryer is one of the better air fryers available. It has quality features that allow you to cook a variety of foods, and is safe and operational for any home. If you want to eat healthier, you should give this air fryer a glance. 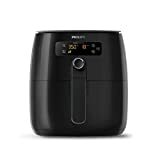 Check out things to consider when buying an air fryer, and you will find that this air fryer meets most buying criteria. This air fryer can hold up to 3.5 quarts of food, allowing you to cook a generous amount of food. When you’re trying to feed your whole family, you need an air fryer that can produce everything quickly. Even though it is a larger air fryer, you can count on it to produce excellent results for your food. You can cook dinner for the whole family quickly and easily in this air fryer. The large capacity is perfect for families and couples that don’t mind leftovers. Leftovers are good to put back into the air fryer and get delicious results. If you want a larger air fryers to cook for the whole family, learn more about NuWave Brio Digital Air Fryer 6 qt review. For those that love to have modern appliances in their home, they’ll love the digital controls on this air fryer. You don’t need to try and finely tune the air fryer to your preference. You will have accurate and consistent results thanks to the digital controls. If you’ve never used an air fryer before, you’ll benefit from how easy this air fryer is to set up. No matter what type of food you want to cook, you can rely on the air fryer to deliver on a delicious meal every time. It’s perfect for any type of cooking you want to do. Many people complain how their air fryer doesn’t get hot enough, but you won’t have that problem with this air fryer. It can reach temperatures of 390 degrees F, making the cooking process quick. You can set the temperature in 5 degree increments, which allows you to select the perfect setting for the food you’re cooking. You can enjoy a hot meal in minutes, and it will come out cooked to perfection every time. It’s practical for those that don’t have a lot of time on their hands. Anyone can use the air fryer to cook a snack, or a delicious meal. 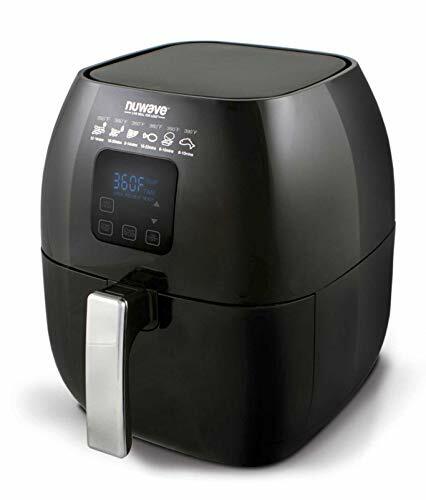 NuWave company claims that this air fryer can distribute hot air evenly with temperature fluctuation of less than 5 degrees F while some other air fryers distribute hot air which is greater than 10 degrees F above or below the set temperature. This even heat distribution ensures that your food will be cooked evenly. 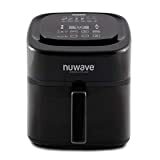 If you are looking for an air fryer that provides a wider temperature range, you can check out NuWave Brio 3 Quart Digital Air Fryer Review. The air fryer includes an auto pre-heat mode that provides an accurate temperature when you place your food in the air fryer. You will have accurate cooking temperatures for the food you’re cooking. No matter if you’re cooking poultry or thick vegetables, you can use the pre-heat mode to create the perfect cooking environment for your food. 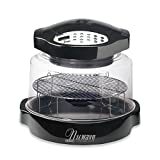 This is ideal for those that don’t need an air fryer to simply heat up their food. Instead, you will have perfectly cooked food every time you use the air fryer. It’s good for anyone that needs a reliable air fryer. The air fryer comes equipped with an advanced safety feature that makes the air fryer perfect for any home. The safety feature ensures the air fryer won’t start cooking until the cooking basket is put in place. This is the perfect feature for those that have never had an air fryer before. Since it won’t work without the basket inside, the air fryer is one of the safest appliances in your kitchen. This is the ideal feature for those with kids. When they come home from school, they may forget about the air fryer. Having this safety feature is a must for any parent that wants an air fryer in their home.